in order to guide human development into a positive direction women have to find once again their equilibrium, their feminine strength and with that their voices. They will be the leading voices of tomorrow. This is according to some Indigenous Leaders the only chance to come back to balance on this earth! 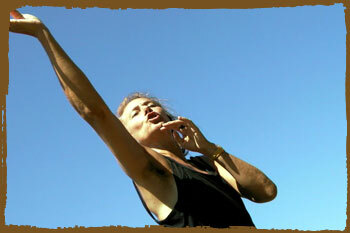 E WAhine is a 2 1/2 year Intensive training that was developed by Eva Geueke with her experience of 20 years with Movement, Dance, several Somatic Methods and Shamanic work. The motivation for this training stems from this message that was given to her from her Native American and Hawaiian Elders. who are managing, counseling and leading people or organizations, e.g. in medical, artistic, therapeutic, educational and business settings. Women who realize that conscious work with the body offers a huge possibility for themselves and their clients to peel away dysfunctional and disabling habits in order to become truly themselves. E WAhine stimulates our ability to bring ourselves back to balance and to participate in the well-being of ourselves, our community and this earth. When we develop with the help of our body more awareness, it is no longer an abstract idea, but leads to deep changes in our habits to think and act. We learn a flexibility of thinking that enables us to respond to the many changes in our environment and in us in an appropriate and constructive way. The development of a more complete self image brings forth true maturation. To learn about the way we use our body and mind is like receiving a map to ourselves that helps us to orientate and organize ourselves optimally in our environment - from inner to outer. Teaches women awareness as basis for a fuller, happier life. Helps women to find their personal joy and freedom. Teaches women to be honest, self responsible and self respectful. visions for themselves and this planet. Enables women to create new ways of communication and relationship. E WAhine Training is envisioned to be a multicultural experience. Women who live in the United States and who are not able to train in Germany can make up in Hawaii. (They will join the main group for the 5-week segment on Maui, Hawaii, in August of 2005.) Women who only want to do the 5-week segment in 2005 must have sufficient experience in Feldenkrais® or Body-Mind Centering® or Continuum. -is an educational system that develops a functional awareness of the self in the environment. The Method utilizes the fact that the body is the primary vehicle for learning. The Feldenkrais Method is an approach to working with persons which expands their repertoire of movements, enhances awareness, improves function and enables people to express themselves more fully. It enables people to include, in their functioning, movements and parts of the body unconsidered, forgotten or excluded from their habitual actions or images of actions. By allowing a person to learn how their whole body cooperates in any movement, the Feldenkrais Method assists people to live their lives more fully, efficiently and comfortably. The improvement of physical functioning is not necessarily an end in itself. Such improvement is based on developing a broader functional awareness which is often a gateway to more generalized enhancement of physical functioning in the context of one's environment and life. Awareness Through Movement® ATM and Functional Integration® FI. Awareness Through Movement consists of verbally directed movement sequences presented primarily to groups. There are several hundred hours of ATM lessons. In ATM lessons, people engage in precisely structured movement explorations that involve thinking, sensing, moving, and imagining. Many are based on developmental movements and ordinary functional activities. Some are based on more abstract explorations of joint, muscle, and postural relationships. The lessons consist of comfortable, easy movements that gradually evolve into movements of greater range and complexity. Functional Integration is the other form of expressing the Feldenkrais Method. -is an integrated approach to transformative experience through movement re-education and hands-on repatterning. Developed by Bonnie Bainbridge Cohen, it is an experiential study based on the embodiment and application of anatomical, physiological, psychophysical and developmental principles, utilizing movement, touch, voice and mind. This study leads to an understanding of how the mind is expressed through the body and the body through the mind. The study of Body-Mind Centering® is a creative process in which we learn to meet and recognize ourselves and others through the exploration of embodiment. Each person is both the student and the subject matter. Principles and techniques are taught in the context of self-discovery and openness. We learn to engage ourselves and others non-judgmentally starting at the place where we are and the place where others are. In this way we seek to find the ease that underlies transformation. BMC® has an almost unlimited number of areas of application. It is currently being used by people in movement, dance, yoga, bodywork, physical and occupational therapy, psychotherapy, child development, education, voice, music, art, meditation, athletics and other body-mind disciplines. -is a rich shamanic dance form that follows the bodies wisdom and uses sound breath and wave like movement to tap into the ancient memory of our cells. This work originates from Continnum that was developed by Emily Conrad By using breath, sound and wavelike movements we undertake subtle and dynamic excursions into known and unknown waters inside our own world. This stimulates neurological growth and supports health and creativity. It builds liquid strength and resiliency. It develops flow of movement inside the organs and within the cells, thus influencing our aging process and slowing it down. WaveWorks-Continuum is a visionary exploration of our ability to develop new, creative potential. We stimulate our liquid cellular intelligence, that correspondence with all of life and thus participate in the movement process of the universe. -is a playful improvised dance form between one or more people where the dancers are using each others weight and are giving leverage to move each other. CI uses a fluent multi-layered vocabulary that includes the whole spectrum from pedestrian movements to acrobatics. The Contact Dancer knows how to take weight and to give weight safely. The student therefore learns to be centered, grounded, resilient and fluid. She learns to use leverage, to fall, to roll, to trust ones own abilities and to be in the moment. CI is very divers and so are the people who practice it. It can be very playful and athletic or gentle and slow depending on ones abilities and mood. It is surely full of excitement and nourishes body and soul. 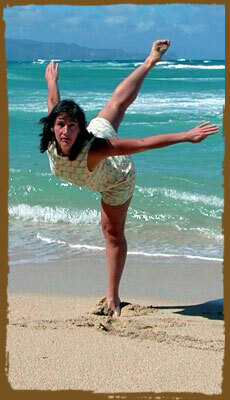 -is a beautiful elegant Martial Arts form from Brazil that combines dance, martial arts, some acrobatics and rhythm. The Capoeira training is a power package that includes a cardiovascular training, as well as stretching and toning the whole body evenly in a unique, playful and varied way. Without doing boring exercises it teaches centering, grounding, coordination, courage, attention and grace. -of Byron Katie is a revolutionary new process of inquiry that is helping people around the world see their problems from an entirely different perspective. In 1986, Byron Katie experienced the profound realization that without any story about how life is supposed to be, we are left with a sense of peace far beyond what we hoped to find by fulfilling our dreams. On the other side of our myths about reality is reality itself, completely indescribable-and unknowable as long as we're still pursuing how things should be. Only when we give up "what should be" can we experience the profound peace of "what is." This "giving up," however, can't be achieved by the thinking mind. (In hoping to give up these attachments, the mind subversively attaches to a concept of freedom.) The remedy that brought Katie her freedom is something she calls The Work, a penetrating inquiry process involving four questions and a "turnaround." By exposing unconscious beliefs to the clear light of direct investigation, the mind wakes up to its innocent mistake and gives up its losing battle with reality. This is what happens naturally when we see that something we had believed proves to be wrong-for example, when we learn years later that a bitter disagreement was actually based on a simple misunderstanding. With. The Work, we don't have to wait months or years to resolve our lingering issues. These four questions make liberating insights happen consistently and on purpose, showing us that everything painful is ultimately based on a misunderstanding-our own. The result of understanding things correctly is peace. -has created a startling and deeply healing way to explore and understand the limitations we impose on our success and health in life, professionally and personally. It allows us to see our agreement to conditions which both constrain us and, often, have little to do with us. The Systemic Theory is based on the idea that humans carry habits of relating and positioning themselves in groups according to the way they learned early on in their families. The aim of Systemic Therapy is to interrupt disabling rules and habits of interaction to establish more meaningful and useful ways of relating. Systemic therapy provides a way of restoring balance to the system and alignment with what is. It focuses rather on the solution than on the problem. Liane Stefans will teach this system with a fresh approach that is movement oriented. "It is women who can break the spiral of power and find subtle tricks of cooperation"
"Nothing is so permanent about our behavior patterns except our belief that they are so." "We do not just do Movement but are a moving self"
"Development stresses the harmonious coordination between structure, function, and achievement." "one grasps that the small world and the great world around are but one, and that in this unity we are no longer alone"
"From the beginning, it was the maternal spirit that fostered cooperation and togetherness in work or worship Political organizations, religious theocracies, States, nations have endeavored in vain to achieve real and complete social solidarity. They are artificial structures; social humanity has never succeeded in adequately replacing the primitive bond to which it owes its existence". "The women has as part of her very sexuality, a sense of the future:a sense of evolution and growth, a notion of differing pleasure for future gains, a sense of the phases and seasons of life, a sense of devotion to the value of the individual human being. These senses are the very basis of human morality". Water and Mother are interwoven; primordial life developed in water. Without water there is no fertility. "For cells to regenerate and regrow, for stiffness to dissolve, for life to return we need to create a watery environment by remembering where we came from, thus invoking the waters in us. To that we add fire-electricity"
The eagle represents clear sight, highest aspiration,the sun, fire, lightening.